DOC recognizes the therapeutic benefit of conservative care approaches. Physical therapy. 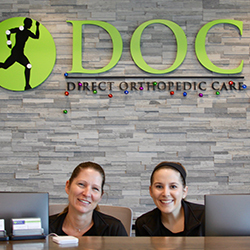 DOC physical therapists examine, evaluate and treat guests with musculoskeletal injuries and chronic pain. Additionally, our PT team helps guests with rehabilitation after orthopedic surgery to promote mobility, reduce pain and improve or restore function. PTs use a variety of treatments to help guests. These can include prescriptive stretching and exercises, manual therapy, massage, and other modalities to reduce pain and promote healing. Taping and Bracing. Taping and bracing may provide support and improved sensory input and result in fewer sprain injuries. Before returning to full function after an injury, the guest may require taping and/or bracing for extra support and to prevent re-injury. Taping is generally best for small joints, fingers and toes. Knees and ankles that help to support body weight benefit more from bracing. Taping and bracing are best determined after in-office diagnosis and managed by your DOC provider. Joint Injections. If rest, medications, and physical therapy do not relieve your joint pain, an injection of a local anesthetic and a cortisone preparation or hyaluronic acid may help. Cortisone, a type of steroid, is a powerful anti-inflammatory medication that reduces inflammation and relieves pain. Hyaluronic acid injections (viscosupplements) are typically used for treating osteoarthritis of the knee. A series of hyaluronic acid injections into the knee joint can help lubricate between bones and cartilage to relieve pain. Regenerative Medicine. DOC Regenerative Medicine therapies use stem cells and platelet rich plasma (PRP) to help promote regeneration of joint cartilage, ligaments, tendons, and can potentially aid in bone healing. Stem cells are harvested from your own bone marrow and centrifuged. The purified stem cells are injected into the damaged joint. These highly adaptive stem cells repair and restore cells and tissue. Platelet-Rich Plasma (PRP) comes from a simple blood draw, which is centrifuged and scientifically separated to obtain concentrated growth factors that stimulate an aggressive healing response. PRP stimulates healing when injected into an injured or degenerated part of your body. Pain Management. Pain can be caused by surgery, injury, nerve damage, metabolic problems such as diabetes, or without any obvious cause at all. The complexities of pain create a special need for physicians with the knowledge and skills to treat pain. DOC pain management specialists provide care using a multidisciplinary approach, a combination of therapies including complementary treatments, relaxation techniques, psychological therapy, physical therapy, regenerative medicine therapies, and medications. When conservative treatments fail to provide relief, musculoskeletal surgical procedures may be necessary to reduce pain and improve function. The musculoskeletal system includes the bones, the joints, and soft tissues, including muscles (which protect and allow movement of bones and joints), ligaments (which connect the bones) and tendons (which connect the muscles to bones). Your quality of life is an excellent guide for you to decide whether surgery is the best option. If you cannot participate in the activities that you enjoy and a surgical procedure would restore your preferred lifestyle, then make an appointment with your DOC orthopedic surgeon.